A.J. Fernandez will debut New World Puro Especial Gordo, top, and the Enclave Broadleaf Belicoso Semi-Pressed, bottom, at IPCPR. Cigarmaker A.J. Fernandez is adding two new sizes to two of his most popular brands—and they are both large. At next month’s International Premium Cigar & Pipe Retailers trade show, AJ Fernandez Cigars will debut the New World Puro Especial Gordo and the Enclave Broadleaf Belicoso Semi-Pressed. 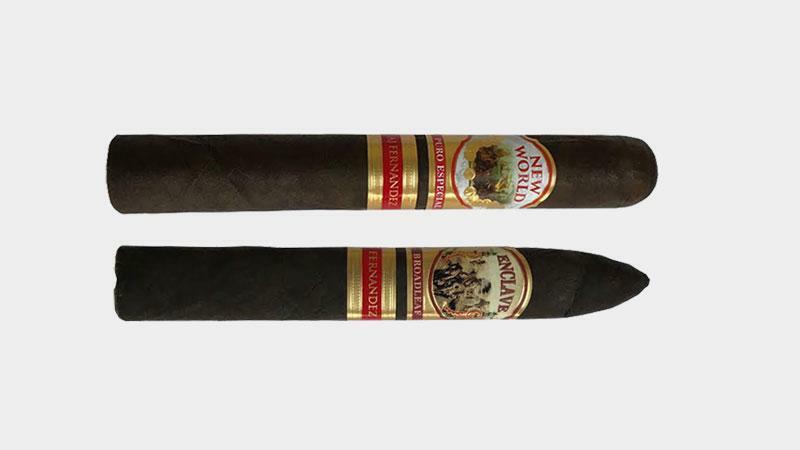 The New World Puro Especial Gordo will measure 6 inches by 58 ring gauge and retail for $9.50 while the Enclave Broadleaf Belicoso Semi-Pressed is 6 by 56 figurado that will cost $10.00. Both New World Puro Especial and Enclave Broadleaf made their way to market last year. Puro Especial is the third release in the New World Series, after New World Connecticut and the original New World, which debuted in 2014. The cigar is a Nicaraguan puro, and the Gordo size will be the fourth vitola in the line. Enclave Broadleaf is the follow-up to the original Enclave, released in 2015. The cigar is draped in a dark, Connecticut Broadleaf wrapper—and the Belicoso Semi-Pressed is also the fourth vitola to join the brand’s lineup. Both new cigar sizes will begin shipping to retailers next month. “We will begin shipping during the IPCPR show,” Frank Santos, marketing director of AJ Fernandez Cigars, told Cigar Aficionado.